We are close enough to Ipswich to sense its orbit, but remote enough for Gosbeck not to be a place that many of the county town's residents will have heard of. The lanes out here meander nowhere in particular, and it is possible to cycle a long way without seeing a car. The villages are generally away from their churches; both Gosbeck and nearby Crowfield are almost a mile from theirs. St Mary sits in its graveyard surrounded by fields, one big house beside it, the air full of birdsong and the rustle of leaves.The solid 14th century tower is one of those south ones you frequently find in the Ipswich area. Externally, the church cannot have changed a great deal in appearance since the 14th Century, but a crisp 19th Century restoration has left a building with an endearingly rustic feel, and a flavour of the dominant enthusiasms of the Church of England in the last years of that century, and the early decades of the one which followed. You step inside to a curiosity: the body of the nave is screened off from the back part, forming a kind of baptistry. The screen is probably contemporary with the font, as the 19th Century becomes the 20th, but the most interesting feature at this end is the iron-bound door to the tower, which may very well also date from as early as the 14th Century. You step through the gap into the body of a well-kept, trim Victorian church. The best feature of the church is the early 20th Century reredos, at once grand and sentimental. Either side of the Resurrection are the raising of Lazarus and the raising of Jairus's daughter - the designers anticipated a less-enlightened age, when people would not know what on earth was going on, by labelling them. The same two outer scenes can also be found flanking the Resurrection in the east window at neighbouring Crowfield. The other pleasing feature is the glass, again turn of the century. The best is probably the Madonna and child in the chancel, but there is a very fine Art Nouveau piece in the Norman lancet high in the north wall - easily missed, but revisiting the medieval convention that even those parts of the church seen only by God should be beautiful. Some panels from the former rood screen are attached to the north wall. Two modern banners depicting the life of the parish in symbolic form, and probably from the Millennium, flank the sanctuary. 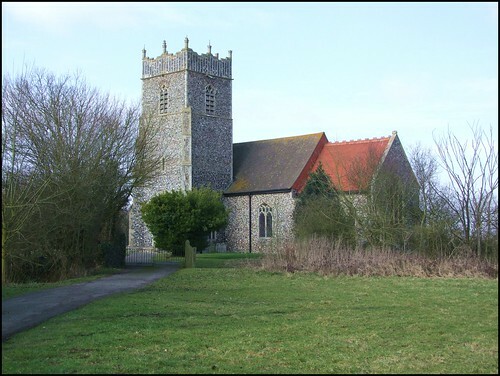 St Mary is a perfect example of all that is best about an ordinary rural parish church: not historically or artistically significant, perhaps, but well-cared for, obviously loved, opened to pilgrims and strangers, and a vital heart of its community. Back outside, the graveyard is an interesting place to wander. There are some unusual brick anthropomorphic tombs to the west of the church, and a skull and bones mark the place where resteth the body of Amy Green, the wife of Abraham Green, who departed this life in 1735, at the age of 25. Such a short life, and so long ago, but still remembered. I made a mental note to ensure that my family also put a headstone up for me, possibly even with the same anatomical details at the top, and then headed on towards Crowfield.